…for the right job, can make all the difference in the world. Research for the Ultimate Deck of cards. What other existing card systems are there, and what interesting features do they have? We can go to the “game system” page of boardgamegeek, and filter by card game. Glyph: Multi-use card system, similar to Rainbow. See link for breakdown. Holydeck: Mash-up. Each card shows a playing card, letter, die result, and a number. The other kinds of card systems are grouped below. The simplest kind of custom deck, still contains the basic structure of [a..b] ranks x S suits, varying the numbers. Some decks have unranked cards outside the hierarchy, such as Jokers or the major arcana of the Tarot. Extended deck of cards for games, which can be repurposed for other games: Mu and More, Rage, Sticheln, David and Goliath, etc. The most common form is the ‘pyramidal’ deck, where there is one , two ’s, and so on, until you have X copies of rank [X]. These are usually unsuited, but some variations have suited cards. Pairs: Pyramid 10 (55 cards). The total number of cards for a pyramid deck of N ranks is N(N+1)/2. The Great Dalmuti: Pyramid 12. Detestable Deck: Pyramid deck 7, + [‘sword’] x 7 suits + [‘gate’] = 28 + 7 + 1 = 36 cards. Finger Bomb:  x 5 suits + [1..5] x 2 copies x 5 suits = 55. For kids. This can be used to play Hanabi. Hanafuda: 4 unranked cards x 12 suits = 48 cards. Pictorial; cards may or may not have ribbons on them. There is an entire class of Asian games using these ‘flower cards’. Jackpot Slots: Unranked cards, different distributions per suit. Quarq: [1..5] x 4 colors x 3 shapes + 12 cards each depicting one specific attribute (i.e., shape only, or color only) = 60 + 12 = 72 cards. Set: 3 counts of objects ([1..3]) x 3 colors x 3 shapes x 3 shading types = 81 cards. 4 Dimensions of cards. In some card systems, each card can have more than one rank or suit. There are many ways this can be done, and some are highlighted below. Deck of Dice: 36 cards. Each card has no suit and two values from [1..6], exhaustively representing all the possible outcomes of a 2D6 roll. Note that a <3, 4> and a <4, 3> both appear, even though these are identical cards. Decktet: Interesting enough to have its own analysis. 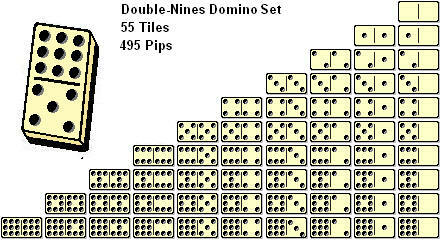 Double Nine Dominoes: Each card has two values from 0-9, but there are no duplicate permutations of cards (i.e., a <2, 3> and a <3, 2> are the same and only appear once). The distribution is pyramidal 10. DecaDeck: 45 cards, 10 total suits, two suits per card (10C2 = 45). The two suits of cards cannot be the same (<A, B> and <B, A> exist, but not <A, A>). Like a double-nine domino set, but without doubles. The cards are also ranked [1..9] x 5 copies each, but I’m not aware of the logic of the mapping of the ranks to the suits. Dual Deck, Dual Value Playing Cards: Normal playing cards, but two suits/ranks on the card. On the upper left side of the card, there is another suit/rank underneath the usual one. Unknown how the ranks are distributed, though it would be nice to have a mathematical basis to do so. Split Deck Playing Cards: card is literally split on the diagonal, one with a white background and another with a yellow background. Organizing the cards this way means that the suits are meant to be used one-or-the-other, not in tandem. Split Suit Playing Cards: Normal deck of cards, but adds four entirely new suits as a ‘sub-suit’ underneath the main suit. Very.. interesting? Visual design, with overlapping suits that look like street art spray paint, though I question the utility. Damage Deck [2..10, A] x 4 + [‘head’, ‘torso’, ‘groin’, ‘left arm’, ‘right arm’, ‘left leg’, ‘right leg’] x 2. Probably used for fighting games and such. Double Play, Versatiletters: Letters on cards, but each letter is an ambigram to a different letter (e.g. ‘a’ and ‘e’), to various degrees of understandability. King’s caste: Extended deck of cards with chess ranks. 16 ranks x 4 suits = [1..8] (pawns), [9..10] (bishops), [‘rook’] x 2, [‘knight’] x 2, Q, K] x 4 suits. See also Royal Chess for cards without the rank. Letter Head, Lexicon: Cards with letters and point values, similar to Scrabble tiles. in Wibbell, Each card has two letters on it. Sigma: 15 types of cards, showing a 3,2 square tile which is either colored black or white. Used for area control games or Go-type games. Binary Playing cards, Zbyte: Normal card deck, but pips have been changed to logical operators (and, or, not) to give additional meaning for custom game. Chards: Patterned after chess pieces. Cards have facing and movement at their sides or diagonals. Duelo Primigenio,: Scan: The back side of the cards shows the suit of the card, but not the rank. See Nertz for a deck superset. Four Operations Math Deck: [1..9] x 6 suits (suits paired into 3 colors). Borders have math operations on them (e.g. 5 has ‘+5’, ‘-5’, ‘x5’, ‘/5’ on the borders. Cards can be overlapped to make equations for games. Perfect Pyramid: Suits look like the bricks of a pyramid and are stacked, meaning some suits cannot be played without the ‘foundation’ of others. Deck of Dice: [1..6] x 6 suits, on d6 faces. Tiledeck: Square tiles. [1..15] x 4 suits. Tiles have “gates” on any or all of its four sides, allowing tiles to be tessellated together. Twist Hold Em Poker Cube – 3×3 ‘Rubiks’ style cube, with card faces. 6 x 9 = 54 standard playing card faces and jokers. I just stumbled upon Matthew Ross’s Singularity deck tonight. It’s interesting to me to see where it’s similar to and different from where your design for the Everdeck ended up! Yep! I LOVE his graphic design. I asked him about the math of his deck as well. https://boardgamegeek.com/thread/2123687/question-about-secondary-suit There’s no higher level interaction between the secondary suits and dice pips, so it’s quite closer to the badger deck than the Everdeck.